This is my new site on Bryn Mawr Traditions. I hope to expand it and include many more pictures and a great deal of history, but that will all take time. Know that this is a work in progress. Stop back soon for new additions! One of the things that makes Bryn Mawr so special is the traditions. Erin Hunter and I were the Traditions Mistresses at Bryn Mawr during the 1997-1998 school year. Basically, we were in charge of the whole thing, from beginning to end. Traditions are really hard to explain and even harder to understand if you haven't been through them yourself. But they establish a sense of community that lasts beyond the confines of the four-year college experience. Women who attended Bryn Mawr in the 30s had the same traditions as I did, and we share that experience with every woman who attends Bryn Mawr from here on out. This is just an overview of that experience. Memories and pictures that I have collected through the process of traditions can be found here and, as soon as I do a little more research, I hope to have a comprehensive history of the progress of traditions throughout the growth of the college. For more information on each tradition, please click on the links provided. Pictures and detailed descriptions are included in these additional pages. Parade Night: On the first night of classes, the frosh are introduced to their sister class, the juniors, as well as to their adversarial class, the sophomores, and the apathetic seniors. This is the night of the first step sing. Lantern Night: In mid-November, the frosh gather in the cloisters where the sophomores will present them with their lanterns. Hell Week: Mid-February brings Hell Week, a tradition that also borrows on the relationships between the classes as established on Parade Night. Frosh participate in a variety of activities with their sophomore "hellers," their "sympathetic juniors," and the seniors. May Day: The final tradition, May Day happens on the first Sunday in May (sometimes the last Sunday in April) after the last day of classes and before finals. The entire college community comes together for a day of medieval festivity and a general good time. Minor Traditions: Traditions begin every day at Bryn Mawr. Each student chooses traditions that speak to her sense of belonging. This section attempts to collect a variety of these minor traditions, from skinny dipping to bell ringing. 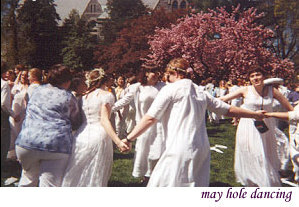 Traditional Music: Many of Bryn Mawr's traditions center around traditional songs. Here is a collection of all current songs at the college. If you would like me to include songs from your Bryn Mawr years, please email them to me.